I love sesame dressing for meats or vegetables. The aroma, texture and colour of sesame seeds enrich the whole dish and bring it up to another level. When it comes to using sesame seeds, I often toast them before use, or I can say, I let the sesame seeds dry pan-fry over medium-low heat (that’s stir-frying without any oil on a frying pan). The heat would bring up the fragrance of the seeds and make it much easier to mash. For making the sesame dressing, I used a kind of naturally brewed Japanese soy sauce, that brings in rich soy flavour, yet not too salty. This dish can be served as a side or salad. Rinse green beans and drain well. Trim both ends. Blanch in salted boiling water for 3 minutes. The beans should be cooked and still crunchy. Drain and immediately rinse in cold water. Pat dry. To make the sesame dressing: Place the sesame seeds into a mortar (or use a food processor to process briefly, and make sure not to overprocess.) 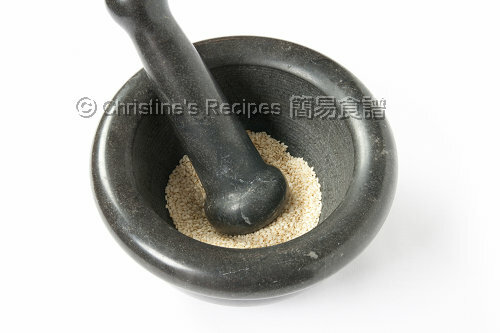 Grind the seeds until almost a paste, then add the sugar, mirin, and soy sauce. Mix well. Season with salt if needed. Put green beans in a large bowl. Mix the sesame dressing with the green beans. Arrange in a serving bowl or a serving plate. Sprinkle more toasted sesame seeds if desired. I used Yamasa soy sauce , that is naturally brewed and not too salty. It's better to toast sesame seeds before grinding. I often dry fry them in a pan. When you smell the aroma, it’s done. Beware not to burn them. Thank you for the sesame dressing! I have enjoyed it once or twice in the past on top of steak but not vegetables. A great way to dress a plate of green beans. 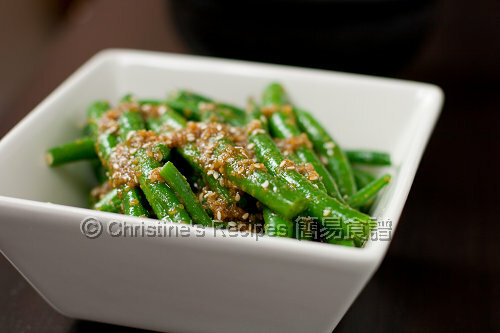 Hi Christine-These green beans look amazing, and so yummy with the sesame dressing. 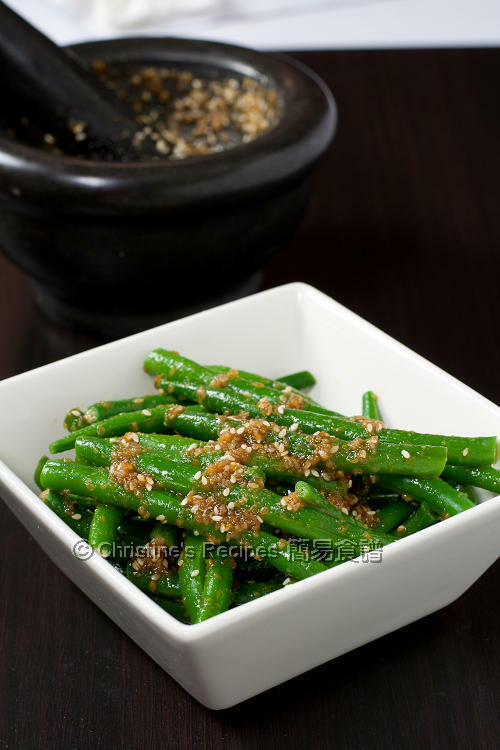 Great Recipe, Green Beans is source of vegetable protein. Love your simple tasty sesame dressing. I don't stock up sesame seeds in my pantry but very often, I use sesame oil + soy sauce and drizzle over steamed veggies such as steamed eggplant! I am not sure abt others but I totally love the simplicity and deliciousness of this. I think I am going to make this sauce tonight with just green vege... should work. I love this dish; i guess it is partially because I cannot resist sesame seeds! Easy and yet so delicious with that kind of dressing! Nice and healthy treat! If not lazy, I'll toast sesame seeds in a 'white wok' as well, or I'd brown them in my oven : ). I love pairing green beans with nutty flavour dressing. I have tried it with walnut and I must try this sesame dressing soon. Thanks for sharing Christine. I´m going to make this today for lunch, I´ll tell you later hhow they were :) thanks! That grean bean look so fresh and yummy. Love this! Easy to make and adds a uniqueness to a favorite of mine anyway! believe it or not I can actually get my kids to eat this when I make it!! :) Thank you!